With the end of 2014 approaching, NAHB’s Eye on Housing is reviewing the posts that attracted the most readers over the last year. In July, we published industry survey data on labor issues. 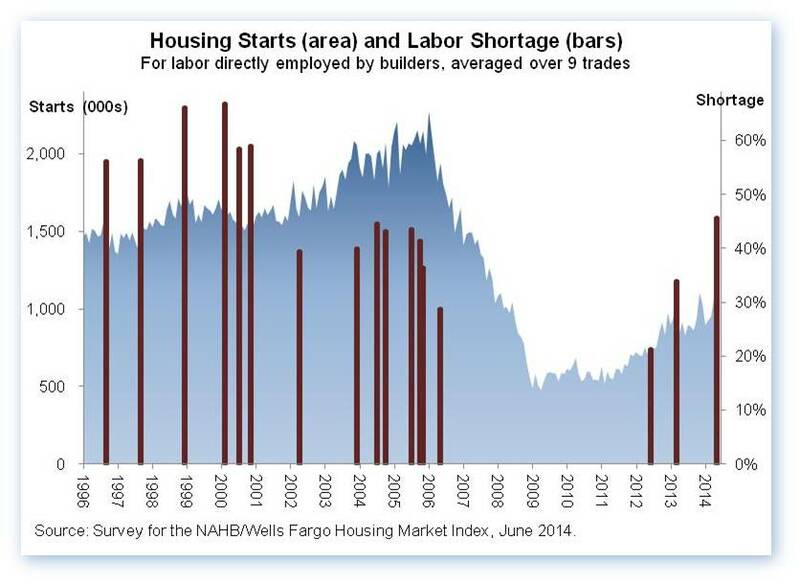 Data from a June 2014 NAHB survey show that shortages of labor and subcontractors have become substantially more widespread since 2013. Shortages are particularly acute for workers with basic skills like carpentry, who are needed in significant numbers during the construction of any home. The incidence of reported shortages is also surprisingly high relative to the current state of new home construction, which has only very partially recovered from its 2008 downturn. Averaged across 9 key trades that have been consistently covered in NAHB surveys, 46 percent of builders reported a shortage in 2014. This is the highest the 9-trade shortage has been since 2000—slightly higher even than at the peak of the boom in 2004 and 2005, when the U.S. was averaging around 2 million housing starts a year, compared to current rates that have mostly remained under 1 million. In the late 1990s, reported shortages were more widespread than they are now, but many things were in different in the late 1990s. In particular, GDP growth was consistently above 4 percent during that period, which drove the unemployment rate down to 4.0 percent. 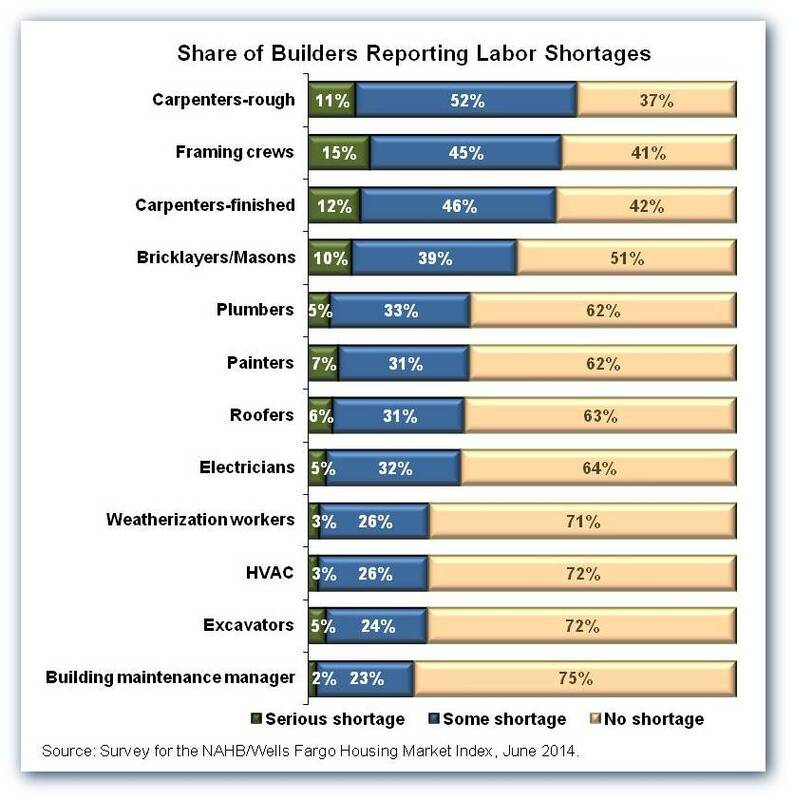 The June 2014 NAHB survey data also show more builders reporting a shortage of subcontractors than of workers they employ directly. Partly as a result, costs of subcontractors are rising faster for builders than costs of directly-employed workers. On average, builders said their direct labor costs on the same house had increased by 2.9 percent, while subcontractor costs increased 3.8 percent. Both numbers were up sharply from March of last year (the first time this particular question was included in the survey). One implication is that any reporting of construction labor statistics that ignores the effects of subcontracting is likely to understate the magnitude and impact of the shortages. For a description of the survey questionnaire and many other details, the full study is available online. Greetings, I have pulled up gearter than 260 sq. ft. of Maple T&G flooring of random lengths, 2 1/4 wide as part of a remodeling project. I was looking to keep this out of the landfill by re purposing it in some way. I tried to contact some architectural reclamation sites and have received no answers. All the nails have been pulled. I also tried craigslist, but have only received an inquiry or two wanting a specific number of feet as if I were a flooring store. Just wondering if you guys were aware of some secondary market for this stuff.